"In the quiet moments, my thoughts always turn to her." 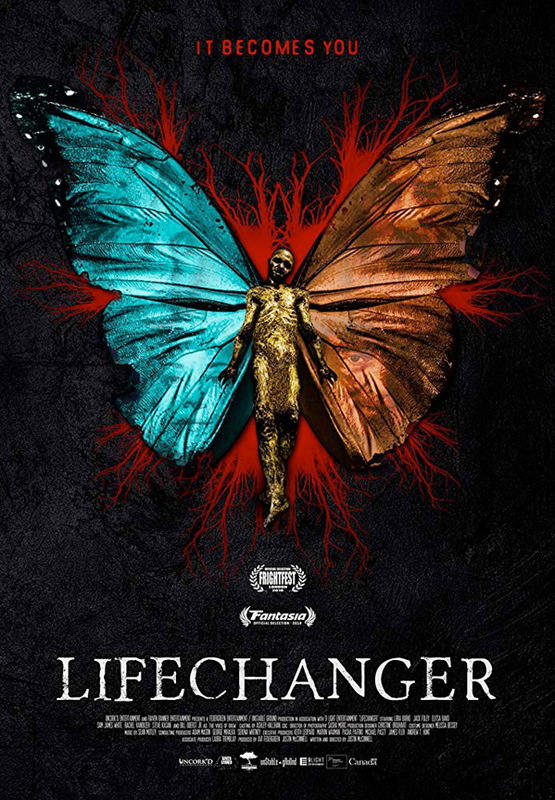 Uncork'd Entertainment has debuted a new trailer for an intriguing horror thriller titled Lifechanger, from Canadian filmmaker Justin McConnell (Check Mate, The Collapsed, Broken Mile). The film premiered at the Fantasia Film Festival earlier this year, and it's described as a horror thriller about a "murderous shapeshifter [who] sets out on a blood-soaked mission to make things right with the woman he loves." Though a different description says that he's "not so much a shapeshifter as a body thief", moving from body to body until it decomposes too much. The film stars Lora Burke, Jack Foley, Elitsa Bako, Rachel VanDuzer, Steve Kasan, Sam White, Peter Higginson, and Bill Oberst Jr. as the voice of Drew. This looks crazy gnarly, especially all the body switches and gore. Drew is Detective Freddie Ransone, a cop who just left a burning house with two bodies inside. Before that, Drew was Emily Roberts, a party girl who became one of those dead bodies, and as the days go on, Drew will become dentist Sam Richardson, his assistant Rachel, and several others. Drew, as it turns out, has the ability to transport from body to body, not so much a shapeshifter as a body thief, for as long as the body remains good before decomposition. But it wasn't always this way - before this, Drew was once able to stay in bodies longer, which lead him to Julia, the woman he still pines for. The ability to change bodies can help bring Drew close to Julia again, but not close enough to stay for long. And that desire to reconnect with the woman he loves so much will ultimately prove to be the undoing of many, perhaps even Drew himself. Lifechanger is written and directed by Canadian filmmaker Justin McConnell, of the films Check Mate, The Collapsed, and Broken Mile previously. This first premiered at the Fantasia Film Festival earlier this year. Uncork'd will release McConnell's Lifechanger direct-to-VOD starting January 1st, 2019.